Amara didn’t spend the night with us this weekend so I thought it was a good time for another episode of Previously on Amara. 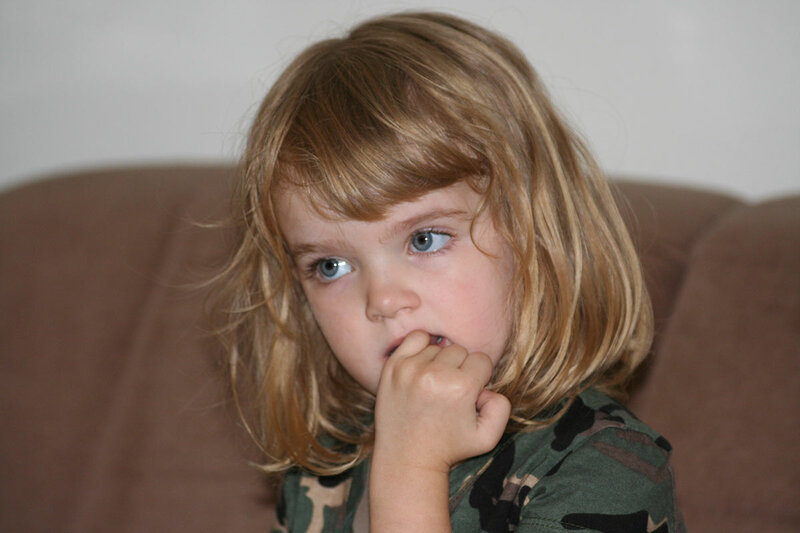 This one comes from Septemeber 29, 2007 and Amara would have been about 3 1/2 years old. WOW, it is hard to believe that was 4 years ago. She is growing up so quickly! One Saturday evening the kids came over for dinner and Amara was going to stay and spend the night. It’s funny, when she was little and her parents would drop her off she would cry for 2 or 3 whole minutes when they left! Most times they didn’t even get out of the driveway before she was smiling and ready to play! As she got older she got more anxious for them to leave so the fun could start. That evening as we were sitting around the dinner table Amara started “picking” at her fingernails, I think she was bored with grownup talk. This thing with biting and picking at her nails was something new she had started doing and that she picked up from… Daddy! I knew that Mommy had been trying to get her to stop. So when she started doing it I told her she wanted to have nice long nails like me and her Mommy — and even Grandpa has nice nails. So she got up and went to each of us and looked at our nails. She goes to me and says “Nice and long”. She goes to Mommy and studies her nails and says “Nice and long”. She goes to Grandpa and studies his nails and says with a little twinkle in her eye “Not toooo long”. And when she gets to Daddy she grabs his hands and looks at them intently. Then she turned around and looked at all of us and shook her head and said “Not nice and long”. She was so cute and smiley. Daddy had to hang his head as we all busted up laughing — which of course set Amara to laughing! I took this picture later that evening. Amara did stop biting them and now has very pretty nails, too. This memory was posted in Previously on Amara and tagged Amara, daddy, finger nails on November 14, 2011 by Grandma Kc. She is just so cute no matter what she is doing! What a precious story. You are such a wonderful story teller! Boy, that some serious look while she’s nibbling that nail. Don’t those big eyes just get you every time? What a beauty. Such a sweet memory!! Did Amara convince Daddy not to bite his nails??? What a darling picture. They do grow up TOO fast. Children really are mirrors to our behavior, aren’t they. Such a cute story. What a cute story! Glad Amara stopped biting her nails. Happy Weekend! I love this picture of your sweet Amara as a toddler! How sweet to share a story from the past. Most of us feel like we know her so it’s great to get some backstory as well! I was hoping you’d offer a grand solution to the nail biting….my daugther is having fits getting her 5 yo to stop sucking her thumb! She’s shown her long nails and promised her a manicure…..but no luck yet! What a fun story. She’s going to love having all her stories written down. My youngest grandson gets teary when his momma leaves but then runs to the cupboard for a treat and is all smiles.